Kagetsu and Konami in their First Deathmatch! While it probably seems like I am on a Konami kick, it wasn’t intentional. Since this event happened back in July, I have been waiting for REINA to release it on DVD so that I could buy it. Unfortunately, the official DVD was corrupted, and only the last two matches were able to be watched. Luckily, this match was the main event so it survived unscathed. My interest in this match was not only due to liking Konami and Kagetsu, but this is first deathmatch in both of their careers. I am not a big deathmatch guy, but I enjoy watching wrestlers out of their normal element to see how they adapt. At some point in their careers, almost all wrestlers have to do a deathmatch, Konami is just getting it out of the way early. To help Kagetsu and Konami on their deathmatch journey are two of the few deathmatch wrestlers that I actually enjoy and long time veterans of this match style. 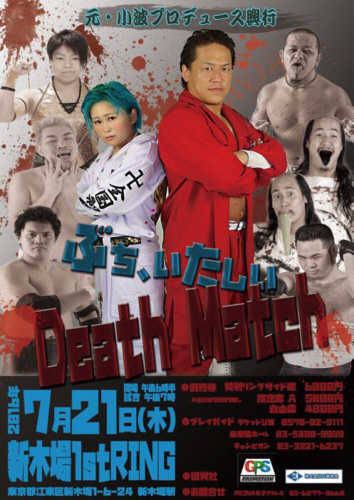 Yuko Miyamoto is a 13 year veteran and is legitimately a quality wrestler, he just happens to like doing deathmatches, while Jun Kasai is perhaps the most famous active deathmatch wrestler in Japan with 18 years under his belt and a veteran of every deathmatch known to man. Kagetsu and Konami picked great partners and I expect this to be an entertaining match. As this is a lighttube deathmatch, there are lighttubes attached to two sides of the ring as well as bundles in two of the corners. The men start out, they do some introductory work before Miyamoto tags in Konami, but Kasai wants no part of badass Konami so he tags in Kagetsu. Konami tags Miyamoto back in, Miyamoto tries to push Kagetsu into the lighttubes but she wiggles away. Wristlock by Miyamoto but Kagetsu kicks him in the leg, Kagetsu tries to throw Miyamoto into the lighttubes but Miyamoto reverses it and Kagetsu is the first wrestler to bleed. Miyamoto slices Kagetsu with a piece of lighttube before hitting a fist drop, cover by Miyamoto but it gets two. Miyamoto tags in Konami, elbows by Konami but Kagetsu dropkicks her when she goes off the ropes and tags in Kasai. Konami and Kasai both grab lighttubes, Konami hits Kasai with hers but Kasai blocks it and throws Konami into the lighttubes. Konami rolls out of the ring but Kagetsu goes out after her and chokes her in the crowd. Kasai rolls Konami back in, Kasai gets a knife-like thing and slices Konami’s head with it. Kasai tags Kagetsu, kicks by Kagetsu and she dropkicks Kagetsu in the back for a two count. Kasai returns, Konami elbows him but Kasai headbutts her to the mat. Kasai gets a lighttube and busts Konami in the head with it, Kagetsu comes in and they both shoulderblock Konami. Kasai gets more lighttubes, he puts them on the mat and hits a piledriver onto them for a two count. Kasai picks up Konami but Konami sneaks in a schoolboy for a two count, dropkick by Konami and Kasai falls back into the lighttubes. Konami tags in Miyamoto, Miyamoto knocks down Kasai and then scoop slams Kagetsu. Lariat by Miyamoto on Kasai, he goes for a piledriver but Kasai blocks it, kick by Kasai and he hits a DDT. Kasai tags in Kagetsu, dropkicks by Kagetsu and she hits a pair of jumping elbows in the corner. Spear by Kagetsu, she gets a few lighttubes and puts them on the mat, she picks up Miyamoto and hits a Samoan Drop onto the tubes. Cover by Kagetsu, but it gets a two count. Kagetsu goes for a spear but Miyamoto blocks it and hits a vertical suplex. Miyamoto tags in Konami, kicks to the chest by Konami but Kagetsu snapmares her and kicks Konami in the back. Konami returns the favor but uses lighttubes with her kick, which is more effective. Kagetsu does the same to her but Miyamoto comes in and they double team Kagetsu in the corner. Fisherman suplex hold by Konami, but it gets a two count. Konami gets a bundle of lighttubes and puts them on Kagetsu’s chest, but Kagetsu ducks the kick and tosses her the bundle before kicking them into Konami’s chest. Kagetsu tags in Kasai, lariat by Kasai but Miyamoto breaks up the cover. Brainbuster by Kasai, he picks up Konami and slams her on the mat. Kasai puts a lighttube bundle on her chest and goes up top, but Kagetsu avoids the Pearl Harbor Splash. Yankee Driver by Miyamoto to Kasai, Konami puts the bundle of lighttubes in front of Kasai’s chest and kicks them into him, but Kagetsu breaks up the pin. Buzzsaw Kick by Konami to Kasai and she hits a fisherman suplex hold, but it gets a two count. Konami gets a lighttube bundle but Kasai grabs it when she goes to use it and headbutts the bundle into her face. Lariat by Kasai, he picks up Konami and hits the double underhook facebuster for two. Scoop slam by Kasai, he goes up top and he nails the Pearl Harbor Splash for the three count! Your winners are Jun Kasai and Kagetsu!